There are so many way you can help us make a better life for Dobermanns that need homes. 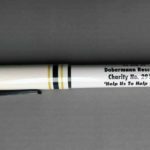 Make a donation to Dobermann Rescue or even add gift aid, this allows us to claim back some of the tax you have already paid and makes your donation worth even more at no extra cost to you. You can donate via PayPal using the button below! Your fundraiser can be anything you like, from a cake sale to a community sports event, to a trek or charity challenge. Simply pick something you feel inspired to organise and get sponsored or charge an entry fee to raise money for Dobermann Rescue. Why not do something completely different? You could organise a car boot sale or garden party, run a disco, become a world record holder, host a golf day, go extreme and have a sponsored leg wax or head shave – or if you prefer not to lose your hair, just dye it a crazy colour and get your family and friends to sponsor you! Or, if you don’t have time to organise something, why not just make a donation. Every penny counts! Once you’ve chosen what sort of event you’d like to run, you can set up your own fundraising page on the Total Giving website – it’s simple, secure and a great way of collecting sponsorship online. 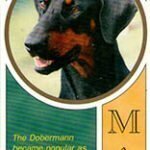 Use Dobermann Rescue merchandise as a source for buying gifts & presents for all occasions. Are you a shop owner or work in a location where a collection box could be placed? 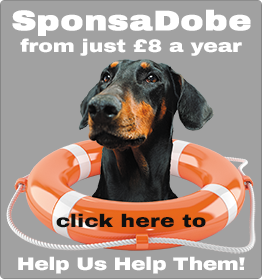 If so apply for a collection box and help Dobermann Rescue raise valuable funds. Join the Sponsadobe Scheme. Raise funds to provide sanctuary and accommodation, giving a more favourable quality of life in one of our kennels for dogs, which unfortunately cannot be rehomed. Unwanted presents can be donated for us to use as prizes in Tombolas and Raffles. These can be sent in to Lynda Tregenna, 1 Heathfield Bungalow, Rose Lane, Lenham Heath, Maidstone, Kent, ME17 2JR, or any area officer. Alternatively hand them in when you see us at shows. Bedding, Blankets, Rugs, Rolls of Carpet, Dog Beds/Toys/Treats/Food/Collars & Leads, even Spades, Shovels, Buckets and Brushes can all be donated to our kennels at Cranfield to help keep costs for kennelling down.